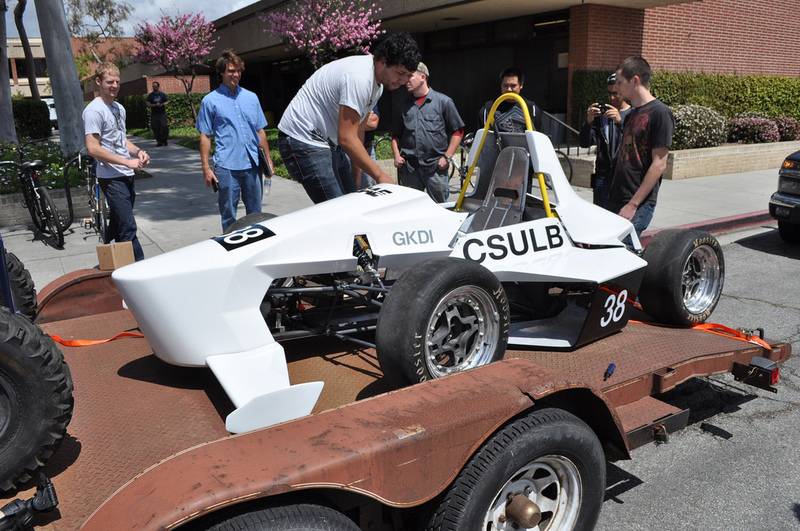 SAE engineers marvel at the sight of the assembled formula vehicle being placed onto a tow truck before being sent off to last weekend's Long Beach Grand Prix. With Paint and Decals applied to the finished body, the vehicle is ready to be put on display for the community of Long Beach! Cesar and Richard carefully positioning the vehicle over the tow-truck ramp. 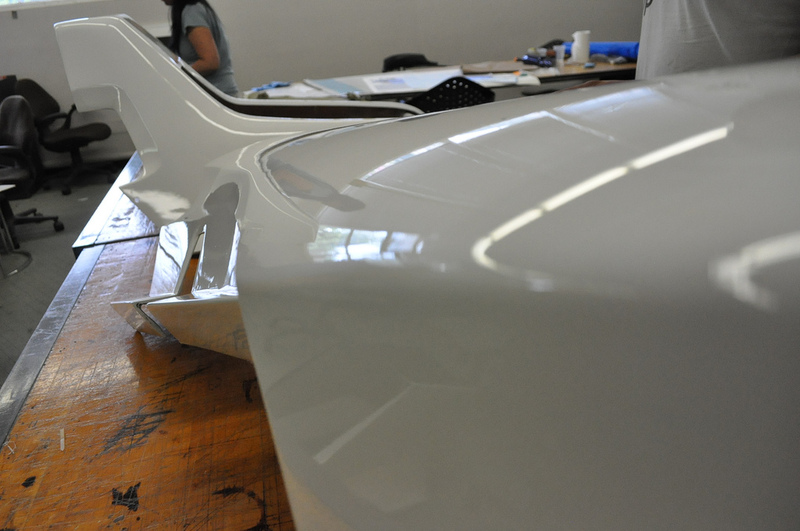 Detail shots of the Formula Panels fresh out of the paint booth! 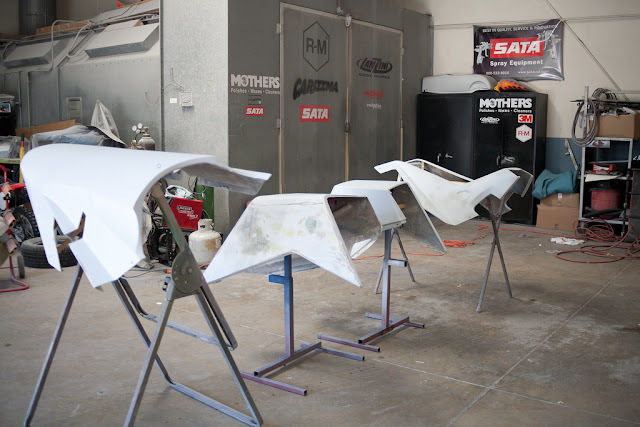 Before the Formula fiberglass panels are paint ready, final fittings are made to display that each panel is flush with the next. After the fittings are all successful, and each piece displays smooth surfaces, then the ready for a final primer treatment. 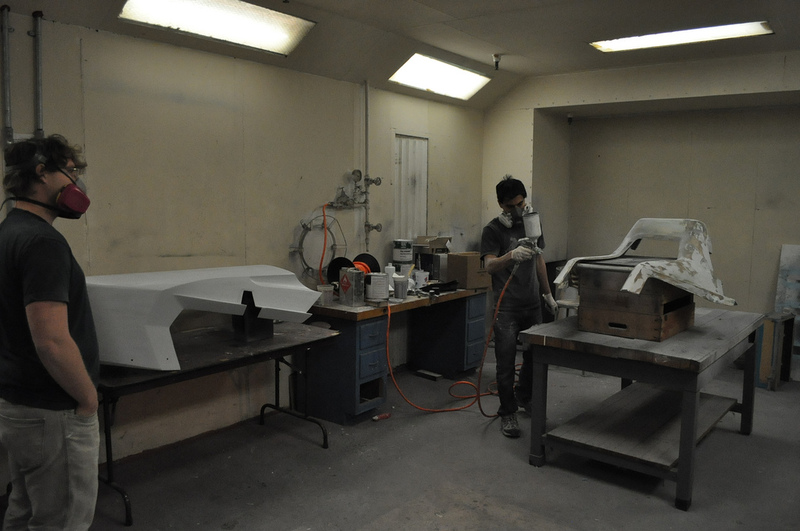 Justyn and Richard applying final coats of primer before the pieces are sent out for painting. 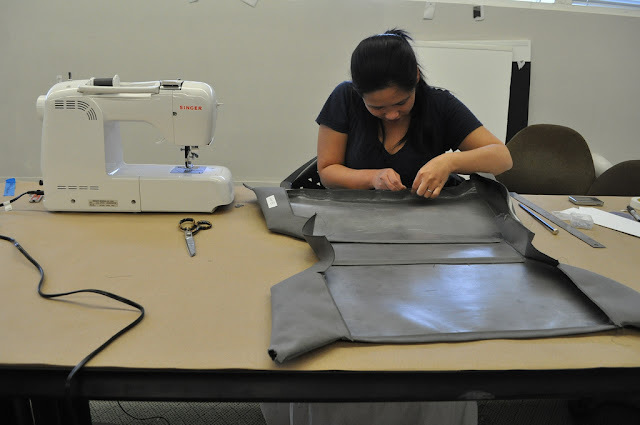 The brackets and inner linings are measured and guided using templates for structural reference. 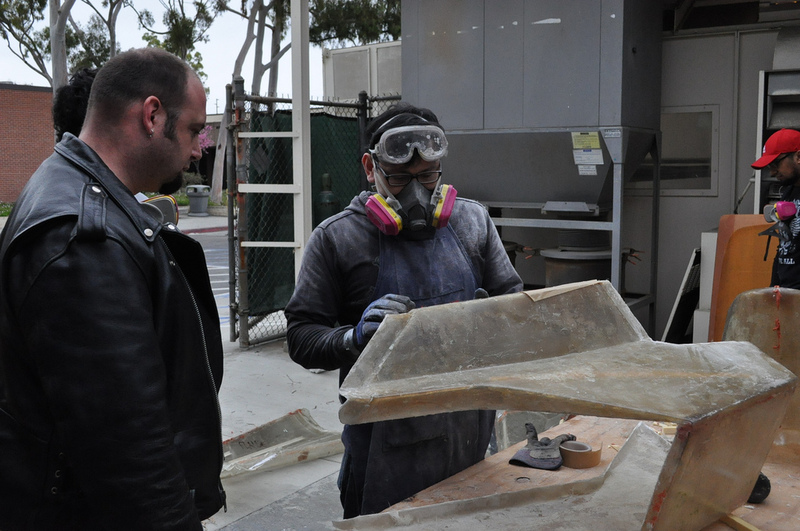 Felix Danishwara shows off some excellent work in smoothing out this acrylic headlight cover. It was CNCed from a block of acrylic and believe it or not, that smooth acrylic used to look like a jagged mess. 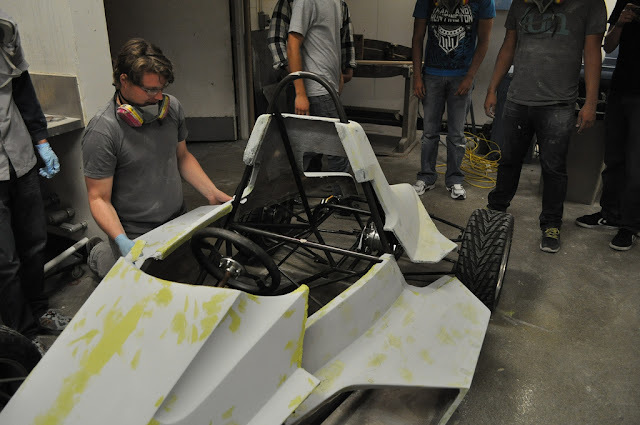 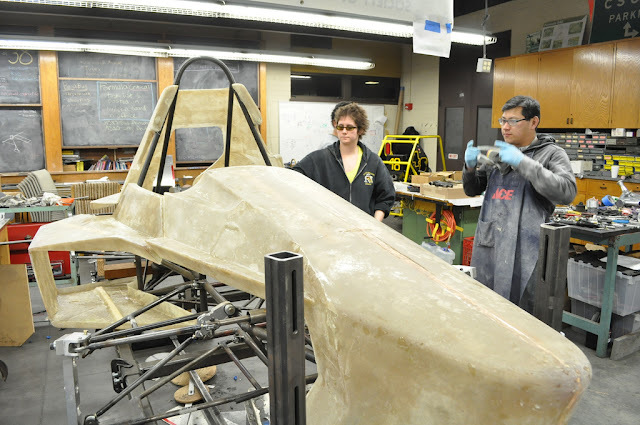 After hours of smoothing, sanding and buffing, the team now has an incredible feature for their car. Conceptually, the headlight can be replaced with a video camera. The acrylic cover would have tear offs on the front to keep a clean view during competition. 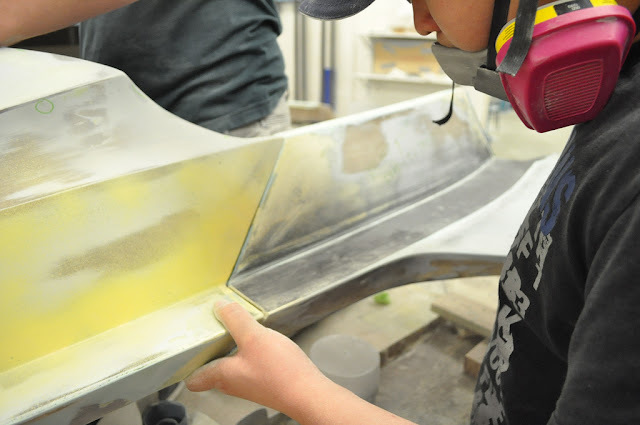 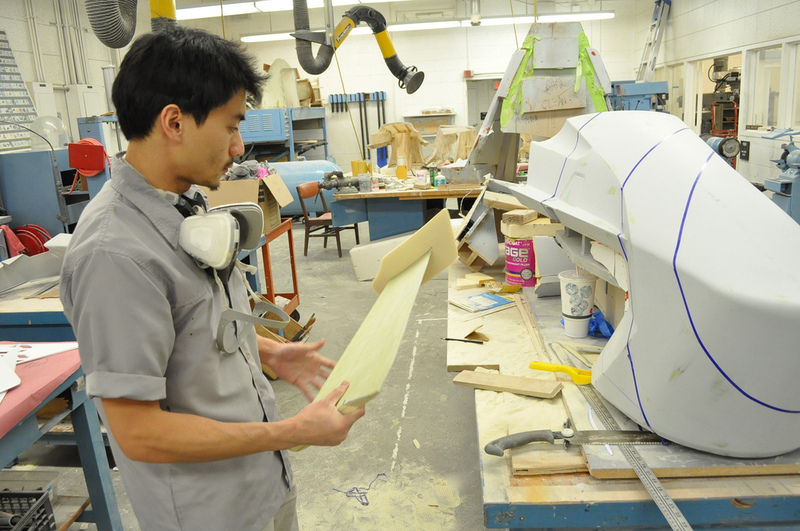 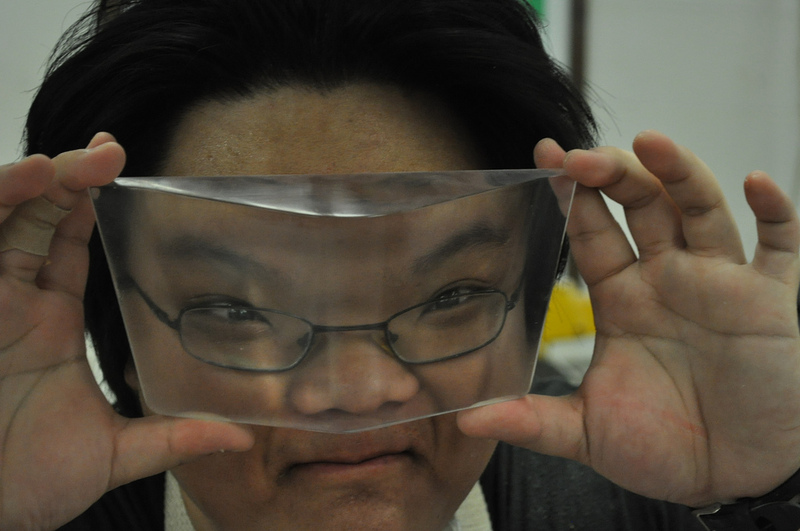 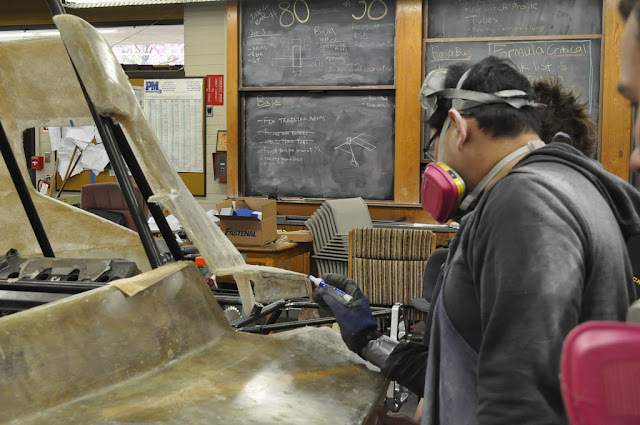 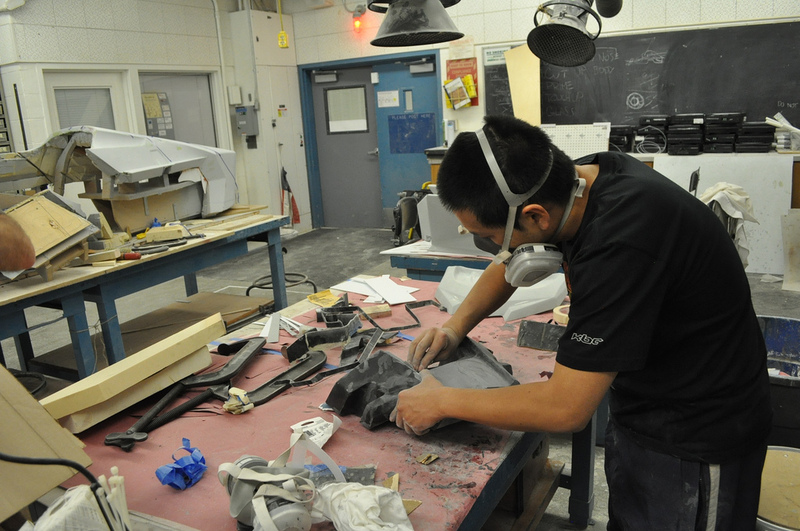 David Jin shown here sanding the Baja front panel. 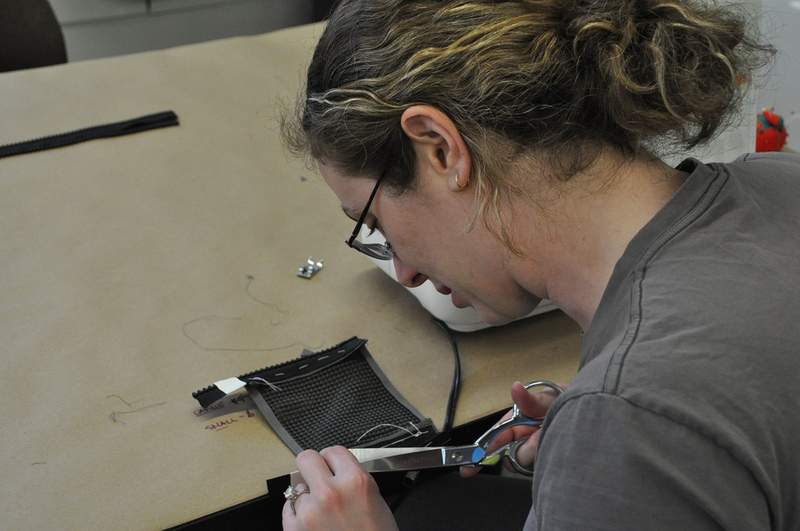 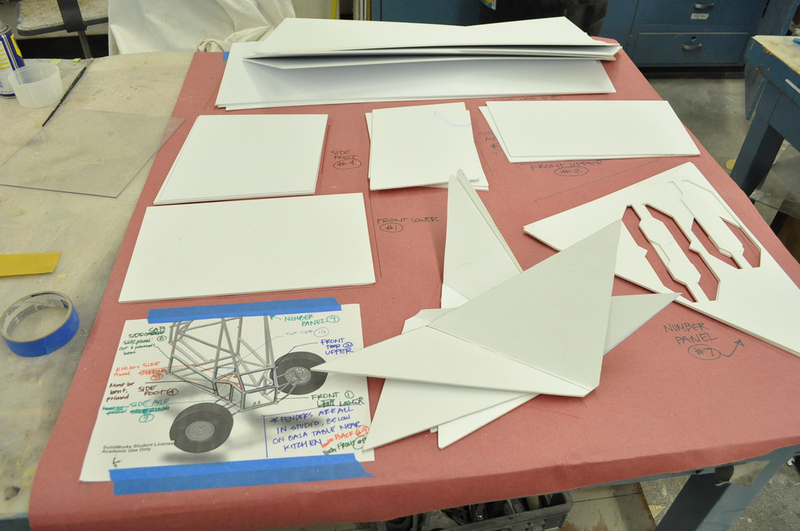 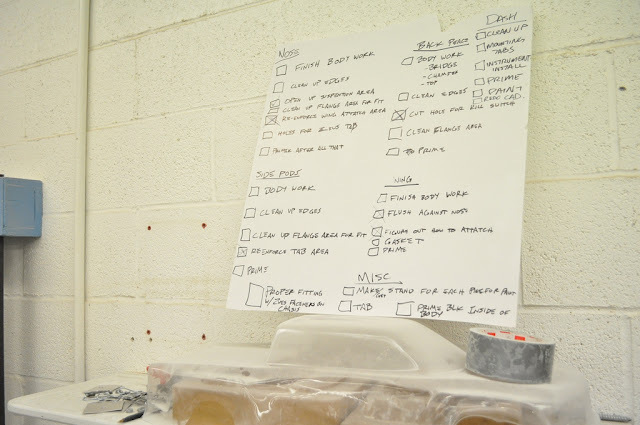 For mounting preparation, Kat Morse organized and labeled the paint ready baja panel pieces. 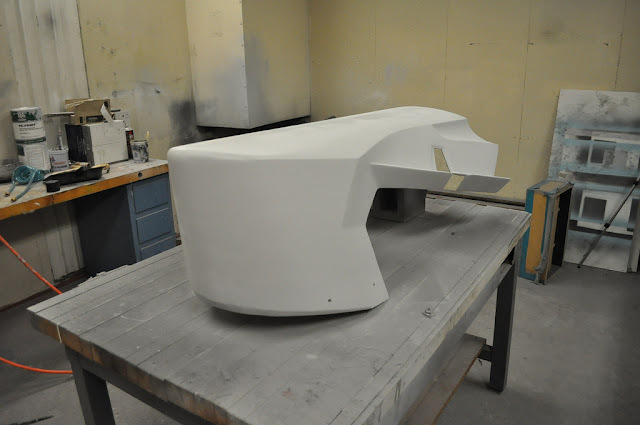 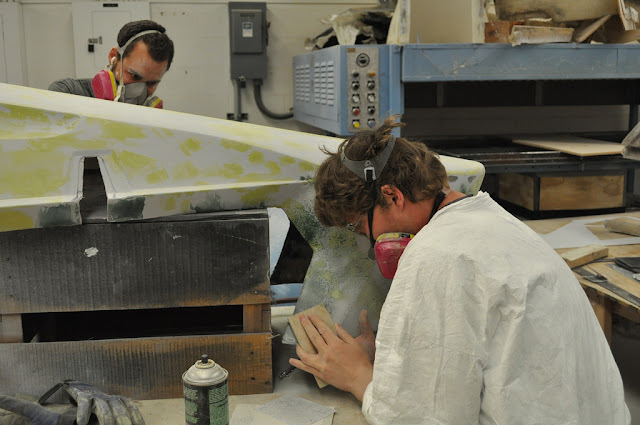 Greg Vanderpol and Justyn Perzyna working on the final stages of the formula fabrication process, which includes sanding and applying filler to the primed fiberglass pieces. 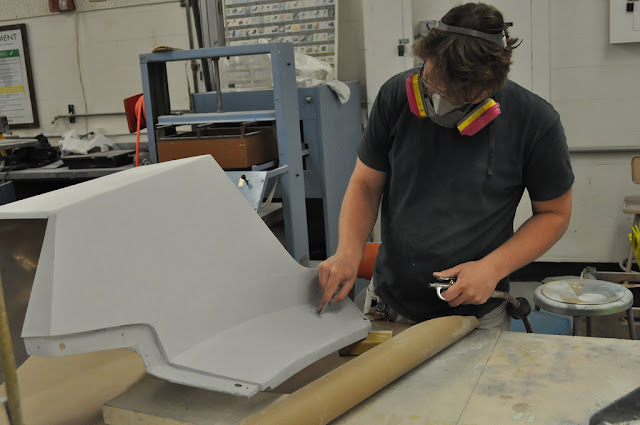 As each piece is primarily covered in primer, justyn helps with panel fittings. 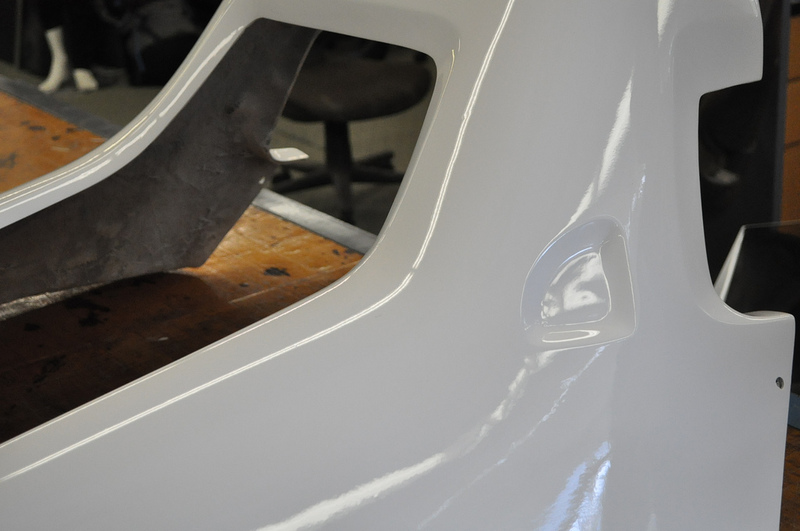 These are made to make sure that each piece is well positioned and flush with the formula chassis. 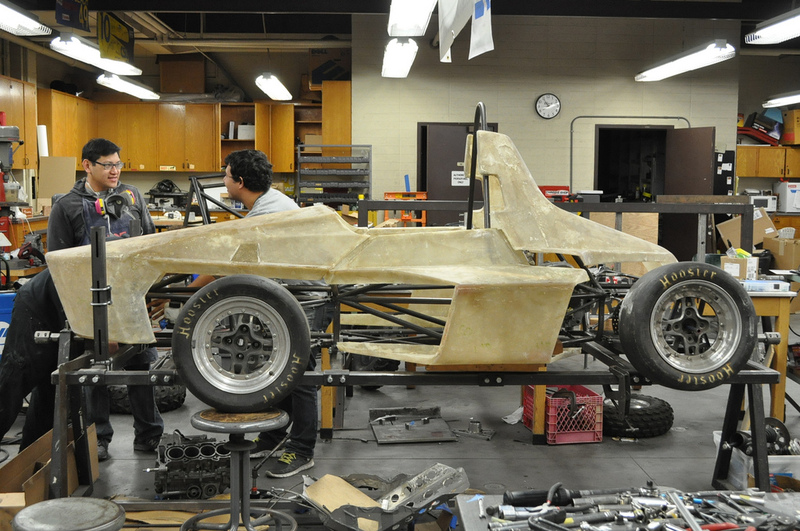 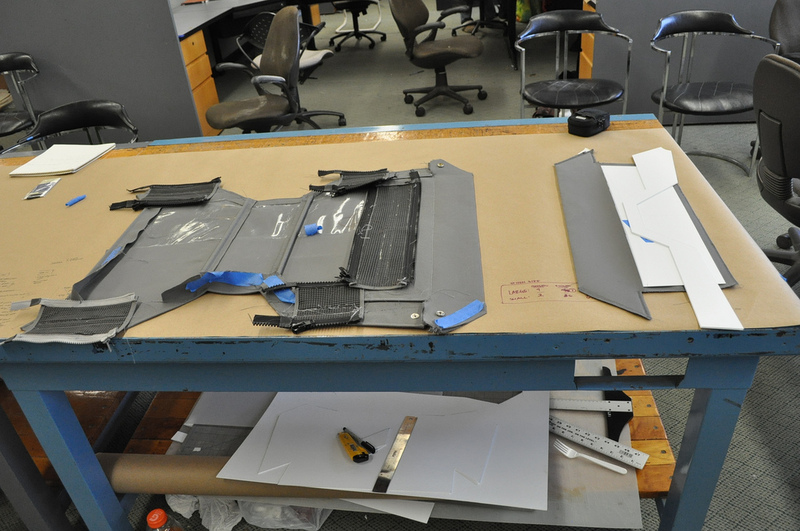 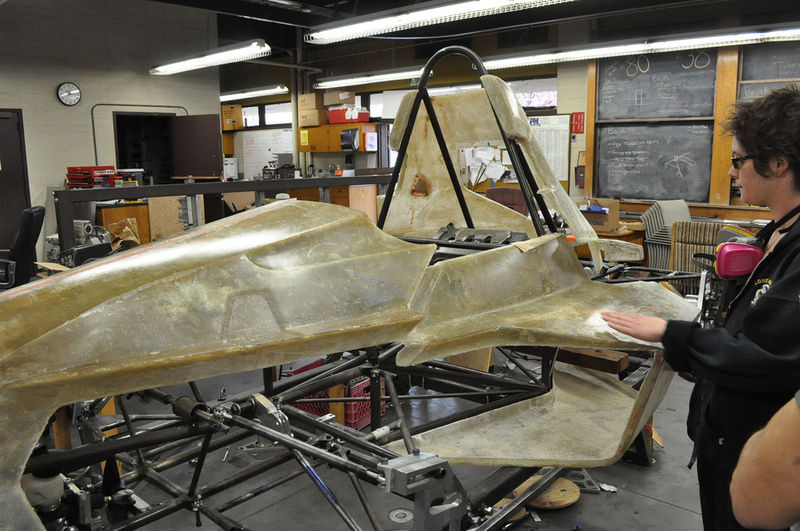 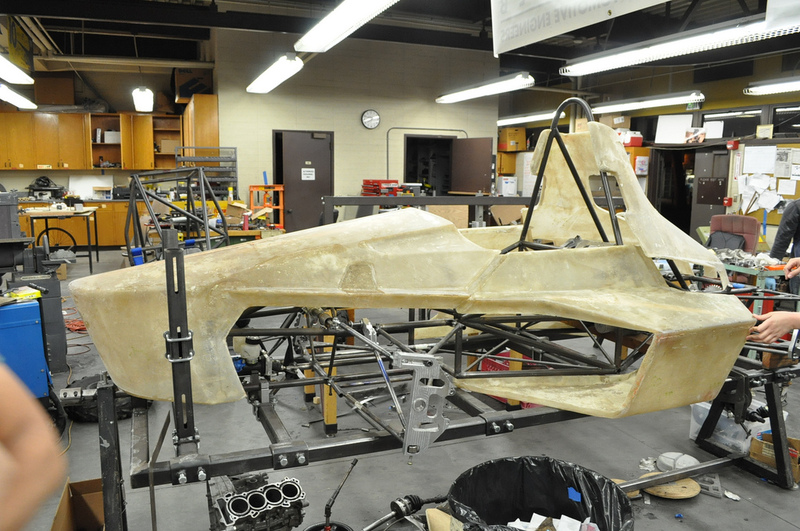 Formula designers began placing fiberglass panels onto the formula race car chassis in order to fit pieces together and to prevent future mounting issues. This step also gave the group a better idea of how to refine each panel. 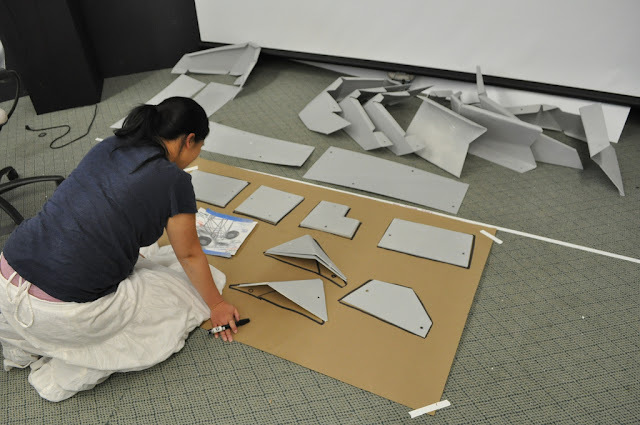 Amber Lundy polishes the panels to help spot irregularities. 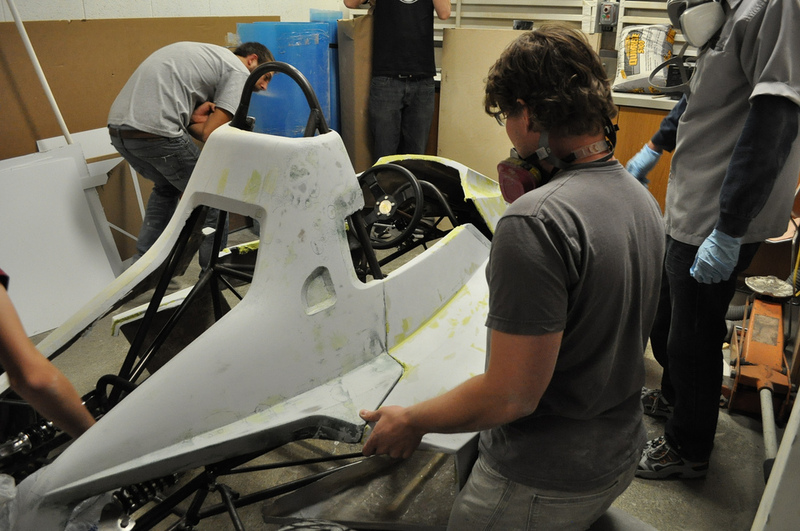 Greg Vanderpol enjoying the view from the driver's seat of the soon-to-be-completed formula racer. 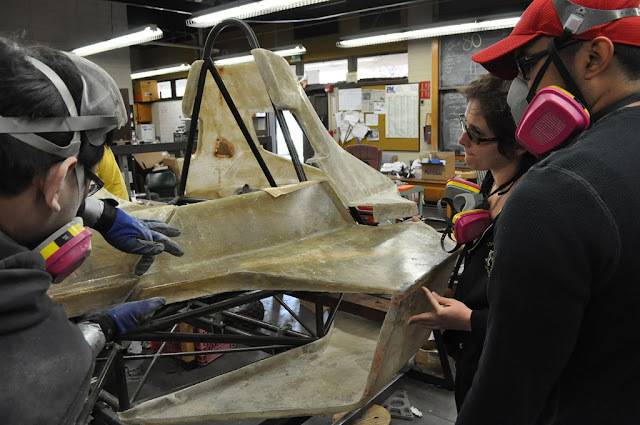 Professor Max Beach overlooking the fiberglass mounting. 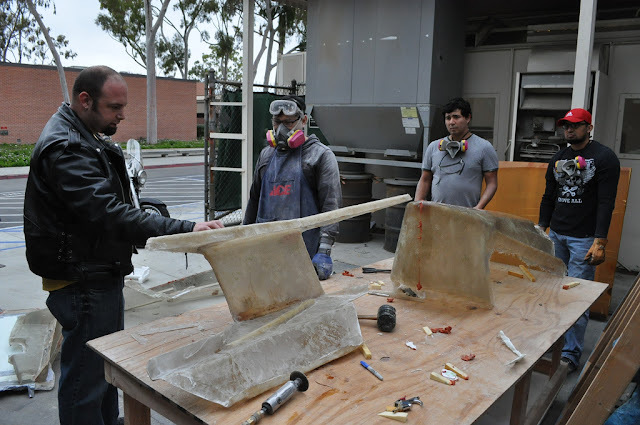 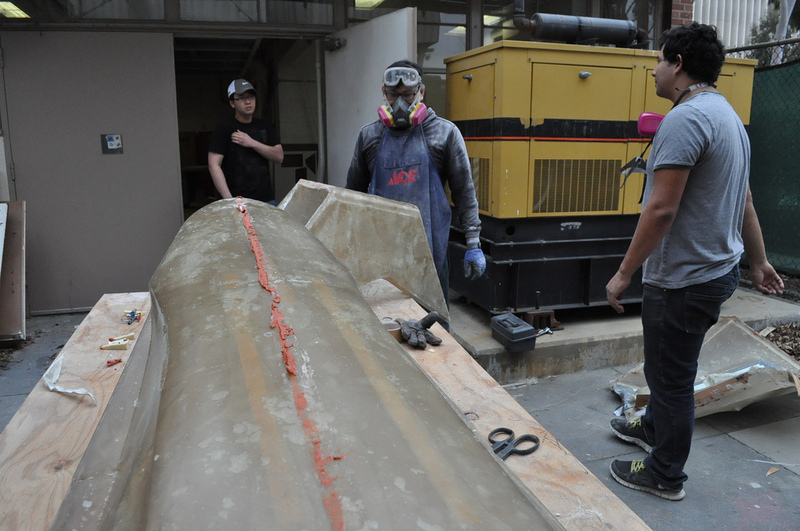 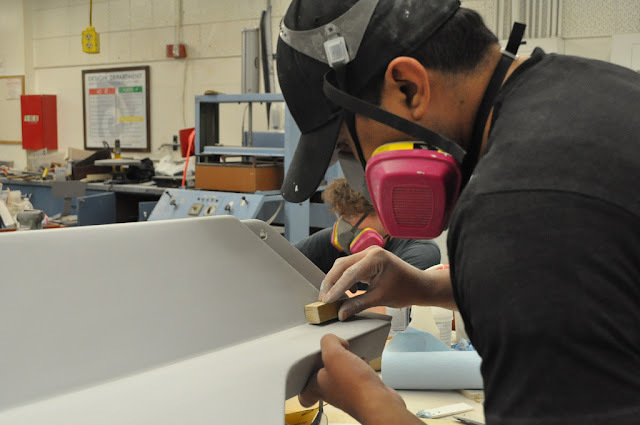 After each fiberglass panel was cured and striped of access material, the Victor Ramos (from left) and Gregory Vanderpol began sanding, smoothing, and applying filler material in order to get each piece ready for fitting and priming. After parts are polished, they are shown to Professor Max Beach for approval. 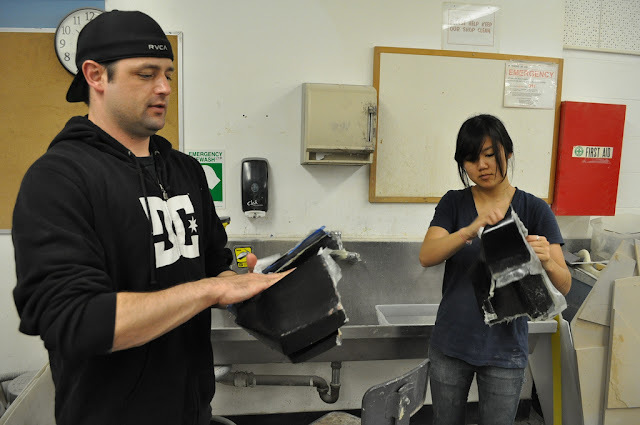 On April 11 a few students headed over to Huntington Beach to meet with one of our Gold sponsors, Redphin Productions. 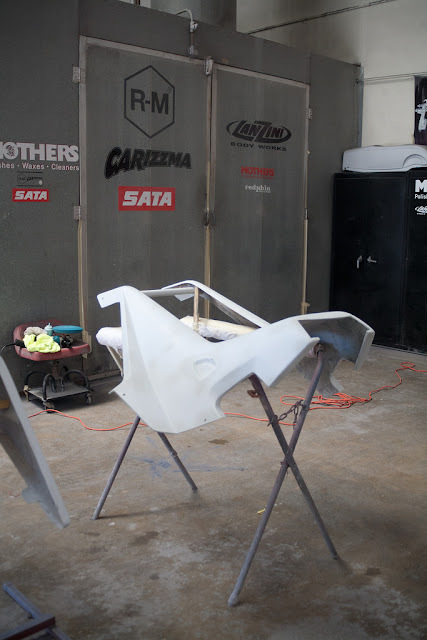 Carson Lev, Redphin CEO and President, had arranged for paint to be donated by BASF, and for Lanzini Body Works to do the painting. 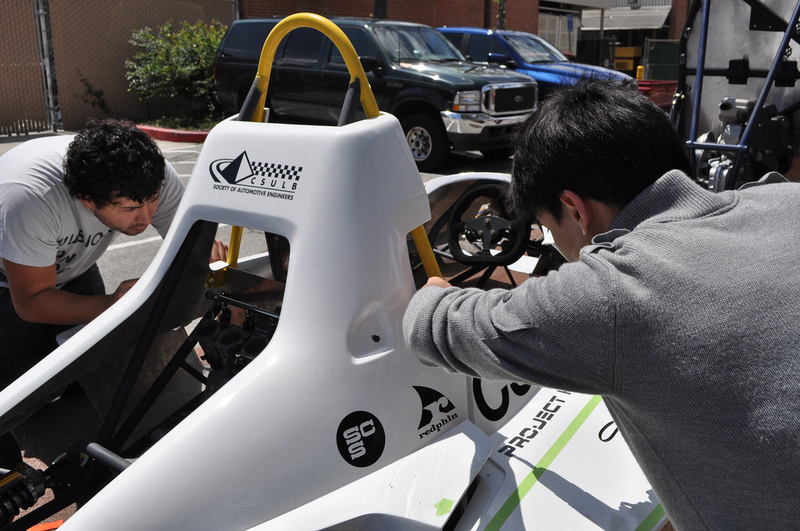 In addition, he helped get Sticky Fingers Design on board with Project HFM by asking them to cut our vinyl graphics for the cars. 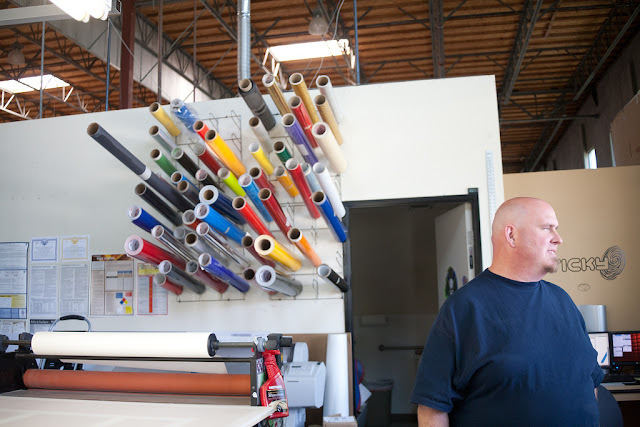 The students spent most of the morning in the Sticky Fingers office learning about the process of vinyl cutting and application, while their own graphics were being printed and cut. Next, they headed over to Lanzini Body Works to see the painted Baja panels. 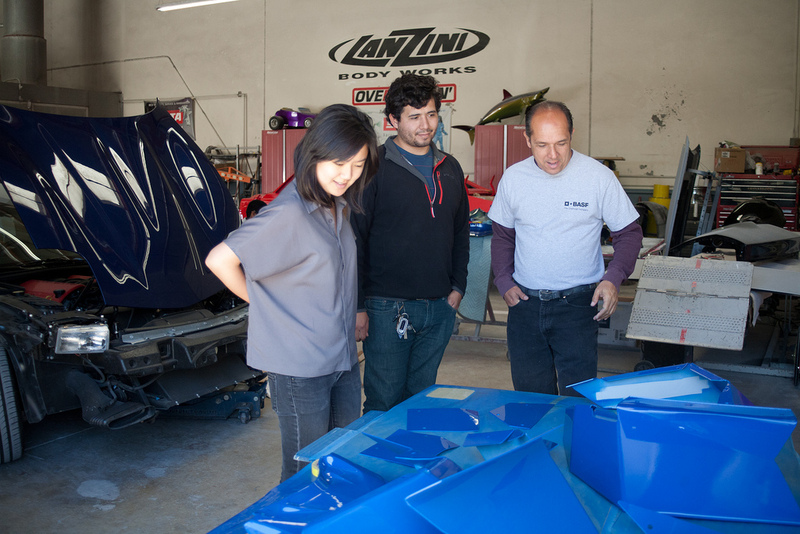 Mitch shows Stella and Cesar the incredible paint job on the baja panels. The Formula body ready for painting. 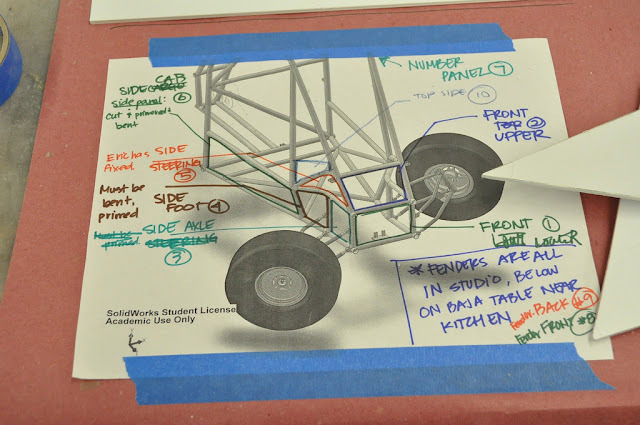 Livery and Graphics are something that has been explored since the first day of class. 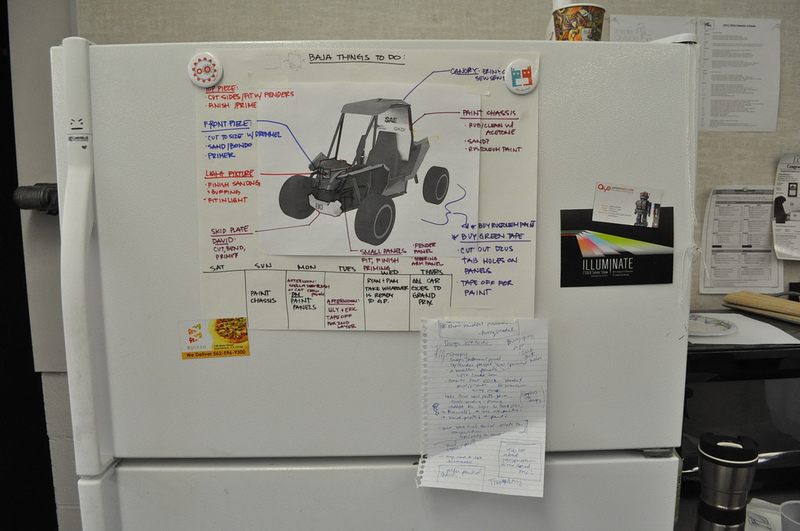 Five students came up with ten concepts each and from there voting was used to narrow down. As the cars became more defined, two livery concepts were chosen to move forward with. 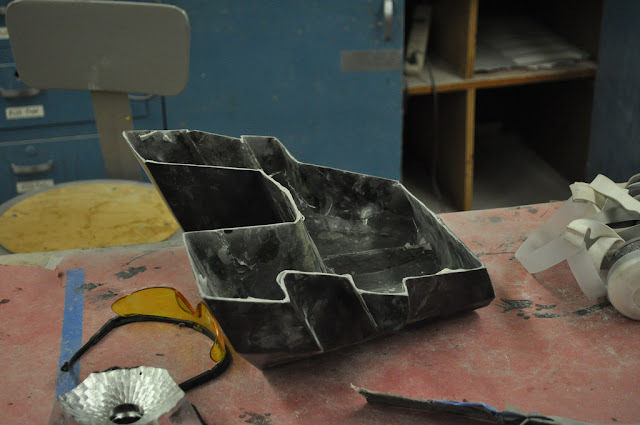 Lantern and Pyramid. 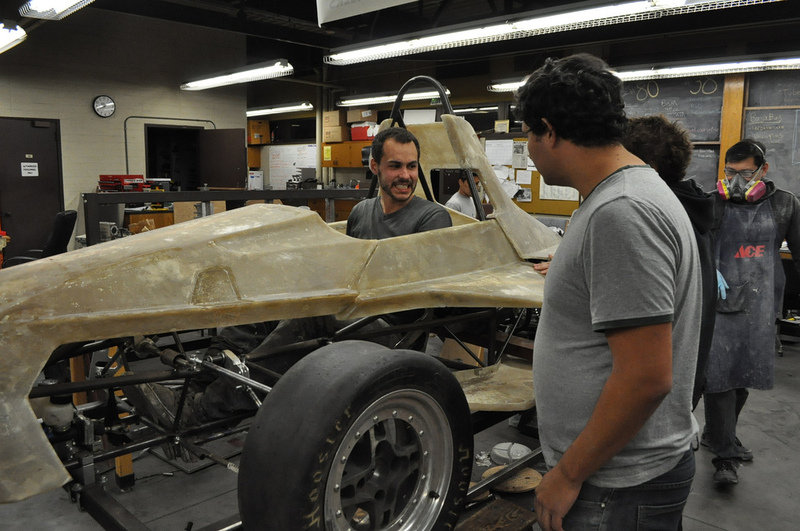 On the formula team Greg Vanderpol explored how these themes could be applied, and Ulysses Martinez did the same for Baja. 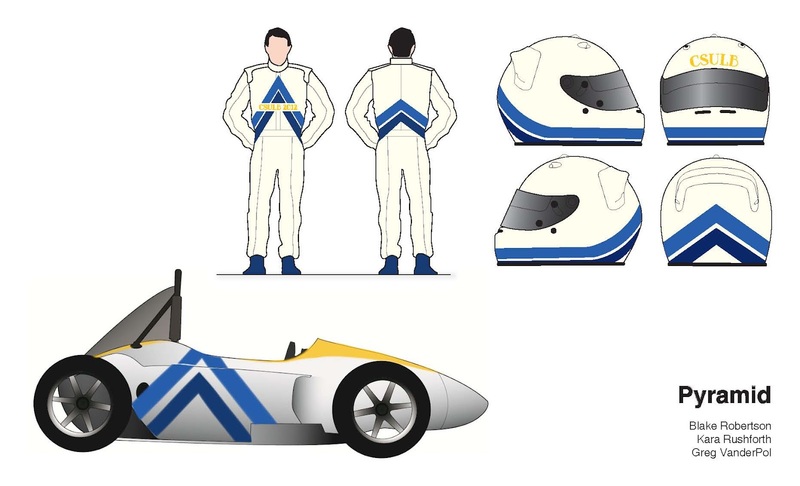 Finally the Pyramid theme was chosen as the livery that would be used on the final cars. 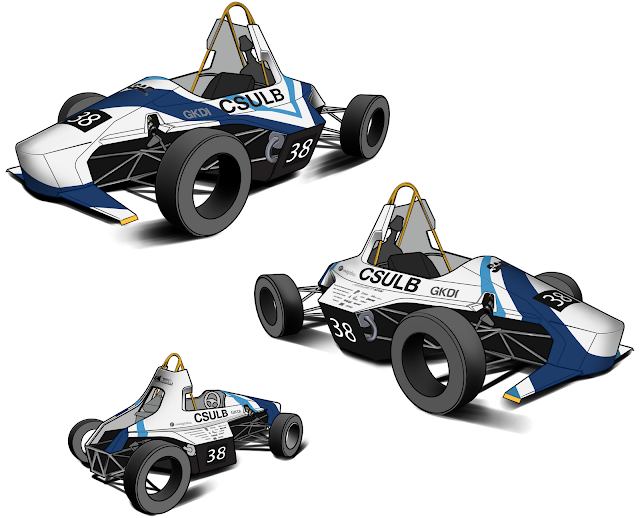 Blake Robertson and Greg Vanderpol came up with the final variation of Pyramid for the formula car, Ulysses Martinez and Stella Lee for the Baja, and Kara Rushforth for the helmets. 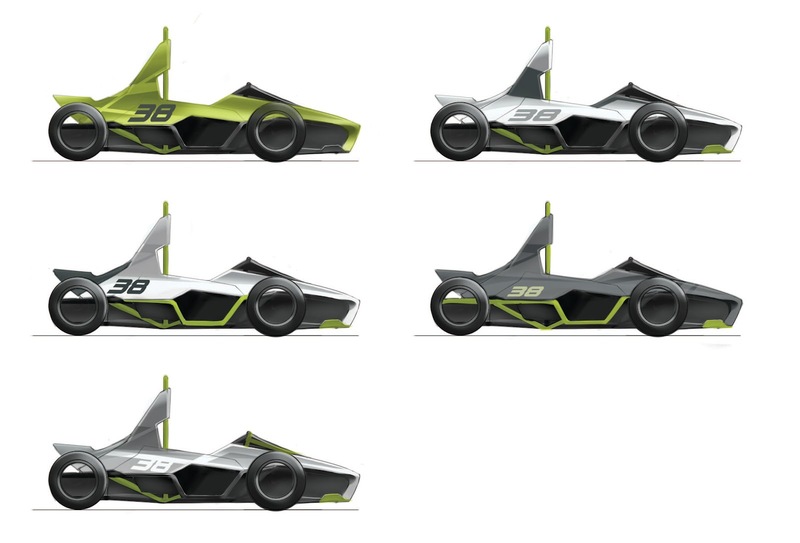 The original concept behind Lantern and Pyramid. Early variations of Lantern on the formula car, by Greg Vanderpol. 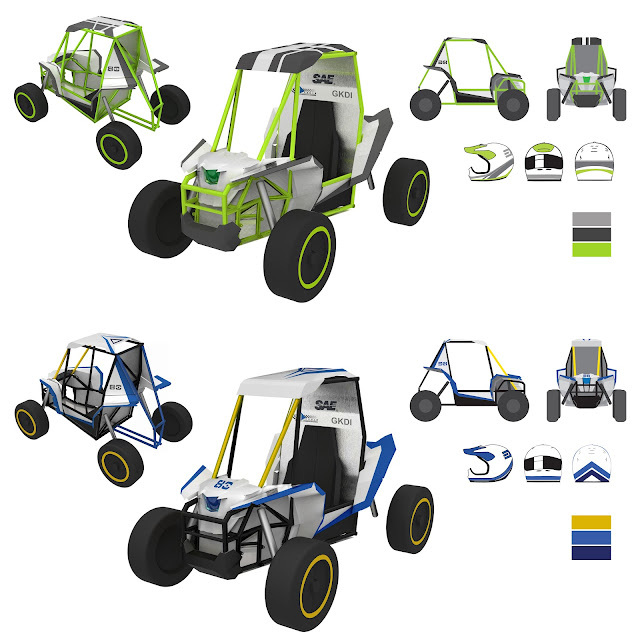 Explorations of both Lantern and Pyramid, by Ulysses Martinez. 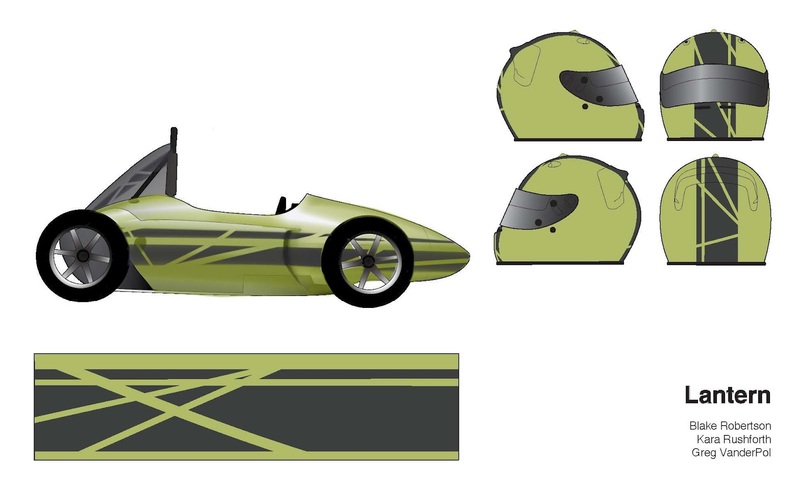 Final livery for formula car by Blake Robertson and Greg Vanderpol. 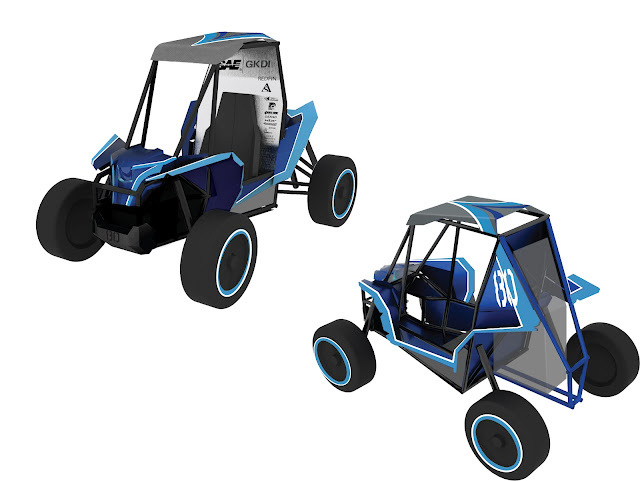 Final livery for Baja Car by Ulysses Martinez and Stella Lee. 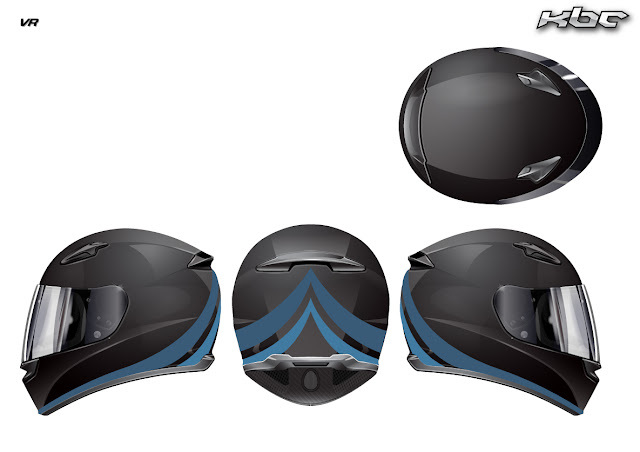 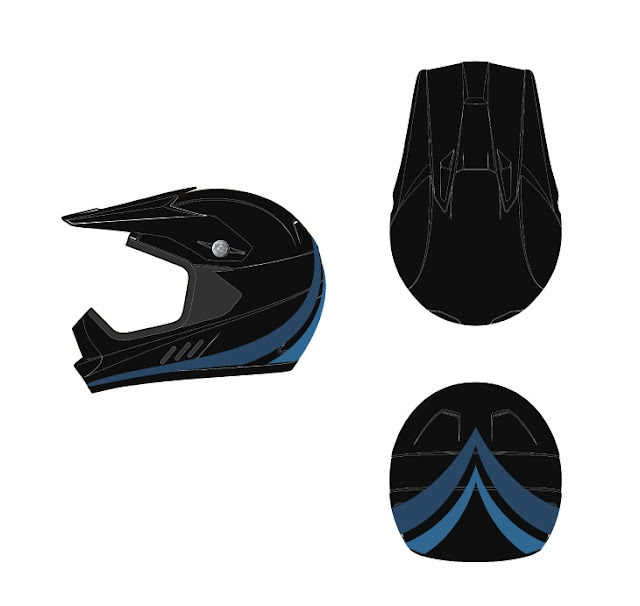 Final helmet livery for Formula (top) and Baja (bottom) by Kara Rushforth.